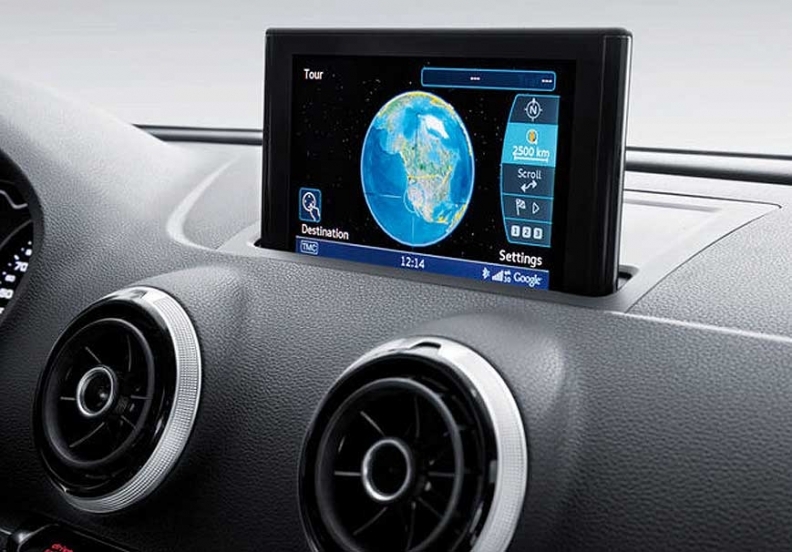 Audi Connect offers in-dash access to Wi-Fi and Google Earth. WASHINGTON (Bloomberg) -- Drivers, start your cars and fire up your Wi-Fi. And please don’t crash while tweeting or making dinner reservations on the interstate. That’s the message from automakers that want to sell lots of vehicles enabled for Wi-Fi, Facebook and Twitter and drown out critics warning of a catastrophe on the nation’s roads as driver distractions proliferate. Volkswagen's Audi brand calls itself the first luxury carmaker to offer in-vehicle access to Wi-Fi and Google Earth. “Google it,” it’s telling customers in advertisements if they want to know more. Nissan Motor Co., General Motors Co. and Ford Motor Co. are embracing in-car systems that access Google, Facebook and Twitter. "If the auto manufacturers focused as much on safety as they do on marketing their products, we would save a lot of lives," National Transportation Safety Board Chairman Deborah Hersman, who advocates a ban on in-car mobile phone use even with hands-free devices, said in an interview. These Web-enabled cars are hitting showrooms as U.S. Transportation Secretary Ray LaHood pushes guidelines, on which comments are due tomorrow, to quell in-dash distractions behind the wheel. The guidelines recommend that no task for drivers take longer than two seconds and that cars be stopped and in park before users can enter navigation commands or use social networking sites such as Facebook and Twitter. The guidelines stop short of recommending limits on devices. That has allowed automakers to praise LaHood’s intent to protect drivers while adding and marketing what critics say are potentially distracting features. LaHood still said this week that automakers must ensure drivers’ eyes stay on the road. LaHood praised Subaru, a unit of Fuji Heavy Industries Ltd., and BMW after they made television commercials urging people not to use mobile phones while driving. The stakes are high. In 2010, 3,092 people, or 9.4 percent of road fatalities, were killed in crashes related to driver distraction, according to the National Highway Traffic Safety Administration. The National Safety Council, an Itasca, Ill.-based advocacy group, said the number is “considerably higher” because not all crashes involving driver distraction are counted. The council estimates mobile phone use is a cause in about 24 percent of crashes. Companies say they are striving to ensure their electronics are easy to use and that their cars remain safe for drivers. Ford, whose MyFord Touch and MyLincoln Touch infotainment systems were panned by Consumer Reports magazine in February for being too hard to use, said it’s devising more ways of bringing Facebook into its cars. "Our engineers have also been working with Facebook engineers to develop unique and safer ways of integrating the car experience with Facebook," Jay Cooney, a Ford spokesman, said in an e-mailed statement. The Alliance of Automobile Manufacturers, whose members include BMW and Volkswagen, points to its own distraction guidelines published in 2002 and updated in 2006 as evidence that it’s responding to LaHood’s concerns. The guidelines specify limits on how long a driver’s eyes may be averted from the road to accomplish a task in the vehicle such as entering an address in a global positioning system. Voice recognition is part of the solution, GM CEO Dan Akerson said on May 14 in an interview at Bloomberg headquarters in New York. The new Cadillac User Experience, which will be in the XTS sedan, will have an iPad-like feel and take some initial steps into voice control features that will grow over time, Akerson said. "When you look at the average car, and we’re guilty of it and so are all of our competitors, you’ve got too many buttons," Akerson said. Manufacturers are developing systems designed to keep drivers’ eyes on the road and hands on steering wheels, said Wade Newton, a spokesman for the Washington-based Alliance. Drivers will keep using electronic devices, he said. "They’re going to do those things whether it’s through the vehicle or through a handheld electronic that they bring with them in the car, and those are devices that were never designed to be used while in an auto," Newton said. When automakers include such options in cars and regulators allow it, there’s a tacit message that they’re safe to use, said Rob Reynolds, executive director of FocusDriven, an anti-distracted driving group. "They only serve to feed an already ravenous appetite for distracted driving," Reynolds said in an interview. "It’s like putting a filter on a very large cigarette and giving people the impression that it might make smoking that cigarette safe." The automakers’ focus on hands-free devices diverts from the point that any in-dash technology may be distracting, said John Ulczycki, group vice president at the National Safety Council. "And now they’ve got things with Internet connectivity where you can make your phone into a wireless router and you can watch videos," said Ulczycki, who testified on behalf of his organization at a hearing on LaHood’s distracted driving guidelines. "It’s just crazy all the things that they’re enabling people to do in their car," he said. "It’s very concerning." The Safety Council called for banning all phone use, including hands-free, in January 2009, almost three years before Hersman did. The NTSB, an independent agency that makes safety recommendations, hasn’t taken a position on in-dash systems or global-positioning devices. The back and forth between the regulator and the regulated echoes earlier auto-safety campaigns, for seat belts and air bags, said Henry Jasny, general counsel for Advocates for Highway and Auto Safety. "It took a long time to get the political motivation and the manufacturers behind putting seat belts in vehicles," said Jasny, who has worked in auto-safety advocacy for 25 years. While safety groups have been talking about distracted driving since the 1990s, when phones began to proliferate in cars, LaHood made the issue U.S. government policy by holding two forums and numerous press conferences since he assumed his post in 2009. He’s created a video series called "Faces of Distracted Driving" featuring families who have lost a loved one to distracted driving crashes.